Free book! Get yer hot, fresh free book! 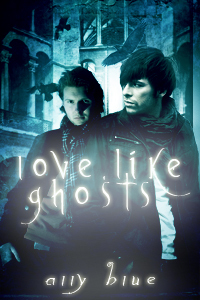 Love, Like Ghosts is technically a part of the Bay City Paranormal Investigations series — the last book of that series, though it can be read as a stand-alone — but it’s the story where Greg Woodhall and Adrian Broussard from the Mojo Mysteries series first met and fell in love. So while it’s not a part of the Mojo Mysteries series, in a way it’s where that series started, because it’s where Greg and Adrian began as a couple. If you’ve ever wondered if this couple and their adventures might appeal to you, now’s your chance to get a taste before Myth Adventures, the latest Mojo Mystery, comes out next month. Personally, I adore this book and my boys, and I want everyone to love them like I do. This entry was posted on September 14, 2015, in Uncategorized. Bookmark the permalink. ← Ally enters the modern age. Sort of.